LEVY L. LARSEN By Elan Hacker, WTS TEEM Intern, Louisburg, Nassau and Marrietta, MN and East Highland, SD. On the outskirts of Billingham, MN, there is a beautiful cemetery. The graves are lined up in neat rows with different types of markers and stones. If you look in the north east corner, far from the other graves is a single stone monument. It is hard to read; the letters and dates are weathered. Levy L. Larsen. Born on August 22 1896. Died February 27, 1906. That is all the story the stone will tell us. A child, a boy, ten years old, is buried there. The words tell the who, but not the why. 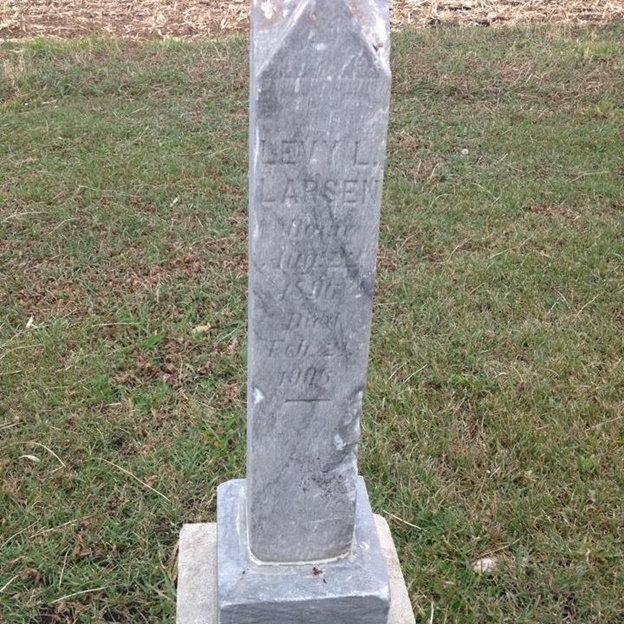 In the days when Levy lived there were a few reasons why his grave would not be included with the rest. Why would anyone have chosen to bury a child at a safe distance from the other graves? None of the reasons are kind. If Levy had not been baptized, if he was a different race, or if he had been born into a world where his parents were not married, he would not have been welcome to lie with the communities’ beloved dead. Several people had heard stories through the years; there are two versions. One is that his parents were not married, that Levy was born and died in a world that ostracized a child, and the mother of a child, born outside of a marriage covenant. The other story has more detail: Levy died of some plague or disease and was buried away from the other graves to protect the dead from contamination. The story goes that people had to walk along the outside of the fence, not even being allowed to step foot on the sacred ground, as though one could die of a disease so repugnant that the fear of it would necessitate the guarding of the other dead, as if they could die again. The only evidence of the truth is the reality shouted by the deliberate placement of his grave: the 10-year-old body of Levy L. Larsen was unwanted and unwelcomed in his death. We can only pray he was loved during his life. In John 11:32-44 Jesus Christ demanded that the grave clothes be removed from Lazarus. As they were, the stench of his death, evaporated into the wind, replaced by life and laughter and love. God promises to make all things new. When we confront the things in our world that are permeated with the stench of death, and in the name of Jesus, remove the covering of death, new life springs forth. There are situations today that cry out to us and touch our hearts. Our sighs stretch up to heaven, and they are answered. And used them on demonic foes! Suffered and died to wash us clean! Offers us life that will not end! Amazing Grace has roots in Love! Our Lenten journey begins where Jesus began his march to the cross. In the wilderness where the Spirit drove him immediately after his baptism, a place of isolation, loneliness and danger. A season when we descend into the valley of the shadow of death to walk with Jesus to Golgotha, the place where he will be crucified. A time when the Spirit also drives us into the wilderness areas of our lives to encounter “wild beasts” and the demonic powers of this world that seek to separate us from the love of God and one another. when we lay our hearts bare before God. The wilderness can be a very scary place. It’s a place busy and preoccupied people try to avoid. Yet, perhaps each of us can recall a time when we found ourselves in the wilderness — alone, helpless, and frightened. My own wilderness adventure happened some 15 years ago as I was making a cross-country trip across a beautiful stretch of interstate running through West Virginia. As dusk approached I realized that I would not make it through the Appalachian Mountains before nightfall. I needed to find a place to stay for the night. To make matters worse, I set out on my cross-country trip without advance reservations. Not a wise move during Memorial Day weekend. “See that road over there. That’s the access road to Daniel Boone National Forest. It’s federal land and I can’t stop you from camping there for the night. Just drive in a ways, pull over, and pitch your tent for the night. It’ll be okay.” I was out of options. Heading into an unknown wilderness and pitching my tent for the night wouldn’t be so bad. Would it? Honestly, the wilderness can be a scary place. came alive that night in a way I could not have imagined. conjured up images of wild beasts making a beeline to my tent. Hungry beasts that I imagined wanted to claim me as their nighttime snack. The wilderness is a place many of us fear. To be alone with only our thoughts, fears, and personal demons is terrifying. Mark’s gospel tells us that Jesus’ wilderness journey is a time of testing. He is tempted by Satan. And he is ministered to by Angels. We, too, are tested during the Wilderness of Lent. A time of soul-searching, prayer, and confronting demons we try to avoid. The “wild beasts” that we pretend don’t exist. The inner demons we wish would just leave us alone. On Ash Wednesday the Spirit drove us into the valley of death. and follow me (MT 16:24). To journey with Jesus into the wilderness areas of our lives. To confront the “wild beasts” and inner demons that lurk within. relationships and sin that afflicts us. Demons of addiction, greed, jealousy. criticizes, and judges others instead of doing the hard work of naming and claiming the sin in our own lives. the good news is that God is gracious and merciful. It is precisely because Jesus became human, was baptized, and was tested in the wilderness, that God understands our sin, our brokenness, and the inner demons that deceive and torment us. Jesus loves you enough to meet you in the wilderness areas of your life. To leave the safety and security of the river bank and to wade out into the watery chaos of the Jordan to be baptized. To claim you as God’s beloved child. To be in relationship with you. Christ’s death in a baptism like his. To suffer and die for you. Abandoned, mocked, and executed on a tree of shame. The One who loves you enough to die for you, comes to you now in the wilderness areas of your life. In the Word of promise proclaimed. At the table where sinners and saints alike gather to receive the body of Christ given for you and the blood of Christ shed for you, for the forgiveness of your sins. And follow me… to the cross. UCC Pastor Jean, Janet, and I all wanted to connect with the girls at Four Oaks at least one time out of the usual during Holy Week. We all felt a strong call to accompany the girls through the life, death, and resurrection of Jesus Christ as remembered during this time because we knew that they have had similar experiences. The call of the Holy Spirit guides us to walk with others through their times of trial, because we have been freed from sin on account of Christ. We wanted to live out that freedom by serving these young who have experienced such pain and change in their lives through some of the practices of Holy Week. So, Jean and I created a worship service for Maundy Thursday. I was completely giddy at the way a Diaconal Minister and a Pastor would be working side by side in leadership and in worship. She would lead the communion portion and I would lead the foot washing. Perfect. And, by the end of the evening, it indeed was a perfect moving of the Holy Spirit, a clear example of how the Trinity dances and invites all who are gathered to join in. When Maundy Thursday rolled around, the three of us met prior to the girls’ arrival to go over last minute details, to set up the space, and to pray. I was incredibly nervous. When we were ready to begin, it came about that we needed to totally rearrange our order of service because we were going to eat dinner with the girls – the dinner they eat (liken it to a school hot lunch), in their space – and we had to eat right then. So, we gathered, said a prayer, then went down to the cafeteria and received our tray of food with the girls who were joining us for worship; we went back into our room and ate together. It was here that I learned one can eat the whole entire kiwi, skin and all. Because the girls are not allowed to have knives to peel off the skin they have to eat the whole thing and honestly it is delicious! After we had eaten, Jean moved us into Holy Communion. Communion, for me, is a fundamental understanding of who the Triune God is. It is God, in Christ Jesus, pouring God’s self out for the healing, redemption, and salvation of all people. This is a gift simply because it is a tangible way of understanding the goodness of God. Communion goes beyond mere words and engages our many senses and humanity is invited to dance in and with the Trinity. It is mystical and common all at once and this particular communion experience changed my understanding and belief of God profoundly. After dinner the dishes were cleared and Jean led us in Confession and Assurance of Pardon and we prepared to give one another communion in the round. However, the most blessed thing happened prior to this moment that shaped the whole experience into something much deeper – Jean’s husband had purchased a bread mix but what was not realized until later was that the mix was a savory Italian bread. So, as Jean explained (with a chuckle and grin on her face) what had happened, the smell of the bread hit me. I can still smell it when I remember this experience, the freshness of the bread with basil and oregano mingling together causing my mouth to water. It was so intoxicating – I wanted that bread! Jean had also brought juice, Welches purple grape juice whose smell combined with the bread sent me into a whole other way of being present. The elements were inviting and I was begging to come. But, I focus on me and really it was the reaction that the girls had that will forever impact my understanding of God and God’s gift of communion. “Oh [mouth full of bread] this is soooooooo good,” one said. And yet another, “I have never tasted anything so delicious.” And still another girl urgently asks, “Can we have more?” My eyes fill with tears as I think back on this experience because this means of grace which I encounter so much in my churched life actually breaks all human barriers and in this instance the Kingdom of God is there in our midst nearly as tangible as the bread and juice we are consuming. All I hear in my heart and mind in this moment is gift from the Holy Spirit “taste and see that the Lord is Good!” And I do, and we all do, and it is good. We all sit in those moments experiencing the goodness of bread and juice made Christ through the Holy Spirit and scripture. We are freed from our burdens, past, present, and future, and we are together in worship encountering the Trinity and meeting Christ in each other. Now, you must understand that this is my communion experience; this is what I saw and lived in those moments of time. It has occurred to me since then what a travesty it is that the church does not often serve fresh, tasty bread to remember the broken body of Christ. It is also a problematic that more often than not the cheapest wine is purchased and shared to represent the blood of Christ poured out for all of creation. We, like the disciples, have forgotten that the poor will always be with us and that to anoint the feet of God with costly perfume is blessing God and honoring the Divine. Perhaps we should bring out the best bread and wine we have so people will crave more Christ! That those gathered may taste and see that the Lord is good not cheap, the delicious recognition of Jesus Christ’s life, death and resurrection as God’s love for all of creation. Now, let us go back to Maundy Thursday. After communion we moved away from the desks that were fashioned into a long table, and sat in a circle on the floor. Prior to our gathering we set up three chairs (covering them with a beautiful cloth) and three basins. We based our foot washing on John 13:1-17 and Jean, Janet, and I did a readers theater of the text so the girls could connect why we were foot washing at all. As an offering to the girls, Jean, Janet and I would provide the foot washing because we wanted to show them what servant leadership was all about, to use this tangible means to illustrate Christ’s love for them. We are clear leaders for these girls but as far as we can tell, the other leaders in their lives have never been as servants to them. Pouring warm water and tangerine smelling oil into the basins, Jean, Janet, and I invited the girls to come and sit when they felt ready. Again, I was unprepared for the experience that was about to happen. A young lady sits at my chair and hovers her feet over the basin and I pour the warm, fragrant water over her tired feet and she lets out a sigh. Then, I wash her feet with my bare hands, gently rubbing them and she groans with a sigh of relief and exclaims, “Girls, you have got to do this, this is amazing.” It was then that it hit me that these girls lack the vital necessity of positive touch, of being allowed to relax and be taken care of by another, of not being hurt or hit or abused by another. It was then that I vowed to wash each of the girls’ feet with attention, intention and love, to safely touch them where their stress and tiredness hides. That evening, all of the girls who were with us had their feet washed. Then, they demanded to return the love by washing our feet! Three or four girls at a basin washing our feet, talking about how good the water smelled and how warm it felt on their hands. They knelt above our feet, studying them and caring for us. When that humbling moment of submitting to Christ’s love for me via the hands and hearts of the girls was finished the Holy Spirit blew the girls into a wind of excitement and love and they left the room to invite the staff to come in so the girls could wash their feet! The staff! The ones who are charged with caring for the girls and all that means, the staff who are exhausted, who yell, who hug, who are bitten by the girls, who restrain them when things get out of hand, who have to remove the privileges of the girls all the time. Those staff. The people who, in my life, I would never run to and invite them over so I could wash their feet. This was indeed an out pouring of Divine Love for the other! A few staff took up the invitation, and Jean, Janet, and I watched the girls lovingly wash the feet of the staff at Four Oaks. It will forever baffle me but will always, always exemplify Christ’s call to love our neighbors as ourselves. The breaking in of the Kingdom of God through community, communion, and foot washing. Perceiving the flight of the Holy Spirit and the hands of Christ at work and the feet of Christ having the dust removed from them. Understanding that this experience, the whole entire thing, is God’s intention for how life is to be lived, in humble service to each other. This was my Maundy Thursday experience, given by the Triune God through girls who have been hurt and abused and removed from society because they are the “bad” ones. They were the proclaimers of God’s grace and love, servants to the people in their midst, testifying to the abundance of God.